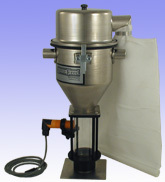 For dusty material, the optional filter bag can be used on either our Standard Loader or Mini-Loader models. This assembly replaces the standard filter and cover. The filter bag seals using an easily removable slotted tube at the bottom of the bag, which provides easy access for cleaning contaminates. The remote filter assemblies allow you to run dusty material without plugging the filter. Filters can be set up to handle multiple loaders. 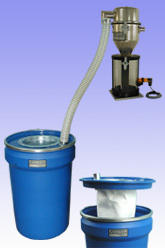 Available in 5-gallon and 30-gallon capacities.